Clinton, Michigan - Eden Foods expands its traditional Japanese food offerings with NEW dried Maitake Mushrooms, dried and sliced Shiitake Mushrooms, and a new package design for dried whole Shiitake Mushrooms. Maitake mushrooms (Grifola frondosa) are native to China, Japan, and parts of North America. They are also called the 'dancing mushroom' as those who found maitake growing in the wild could be seen dancing with joy at their discovery. In the West maitake are known as 'the hen of the woods.' More recently, maitake are being called the 'king of mushrooms' because of the confirmation of their many health promoting qualities. Maitake have been used for hundreds of years in Japanese and Chinese medicine. They are traditionally believed to be of particular benefit to the liver and lungs, cleansing and neutralizing toxins. Modern researchers have conducted numerous studies focusing on maitake's healing properties in regard to various types of cancer and immune system problems. Of interest are carbohydrates in maitake called polysaccharides, in particular beta glucan which researchers believe may be largely responsible for maitake's immune activating and anti-diabetic properties. Other research is finding that maitake may significantly lower blood pressure and cholesterol, and help control body weight by metabolizing fat. 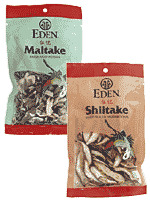 Eden Maitake are expertly grown and dried without the use of chemicals, additives, preservatives, artificial dyes or fungicides. They are grown in a substrate mixture of wood chips or bran that is sterilized by steam heat (commercial mushroom growers use fungicides here as a shortcut). The substrate is inoculated with maitake spores that grow to mature mushrooms in 30 to 60 days. Slow drying concentrates their succulent flavor and goodness. Eden Maitake are an excellent source of niacin (vitamin B3) and a phenomenal source of vitamin D, providing 35% daily value per serving. They are a good source of fiber and also provide high quality protein, thiamin (B1), riboflavin (B2), potassium, iron, phosphorus, magnesium, and zinc. Shiitake mushrooms (Lentinus or Lentinula edodes) have been highly valued in Japan, China, and other Asian countries since ancient times. They have long been recognized as a healing food, a quality researchers attribute in part to the polysaccharide lentinan, a potent immunity booster. In fact lentinan is an approved drug in Japan where it is used for cancer therapy and in AIDS research. Shiitake provide all eight essential amino acids in ideal proportions as well as a good blend of vitamins and minerals. Eden Shiitake are the finest grade referred to as 'donko' shiitake. Unlike commercial shiitake grown on artificial logs that are often treated with fungicides, Eden Shiitake are grown without fungicides on logs of the 'shii' tree, a species of oak that grows in central and southern Japan. Fresh logs are cut in the Fall, holes are drilled and spores are inserted. The logs are placed in pine forests where there is an ideal mix of sunlight, shade, and moisture. In about a year the shiitake begin to push to the surface. Shiitake will continue growing on the oak logs until they have completely decayed, usually after four or five years. Eden Shiitake are harvested at their peak, when the cap is thick, round, and partially closed. They are sun dried preserving their rich flavor and potent nutrients. Eden Shiitake are an excellent source of fiber and vitamin D and a good source of niacin (vitamin B3). They also provide high quality protein, potassium, riboflavin (B2), thiamin (B1), phosphorus, iron, magnesium, and zinc. Eden Dried Mushrooms can be used the same as fresh mushrooms or other dried mushrooms in soups, stews, stir fries, pasta dishes and casseroles. Maitake's and Shiitake's unique flavors blend well with vegetables, seafood, or tofu and a touch of garlic and Eden Shoyu soy sauce. Try them in marinara, creamy white sauce, and gravy. Simply rinse quickly and soak to reconstitute. The soaking water may be reserved and used as part of the liquid measurement in recipes. All Eden Dried Mushrooms are certified kosher.